The Stainless Steel Tool Box Travel Mug displays strong overtones of a worker. Applications do include business, construction, equipment & truck related. 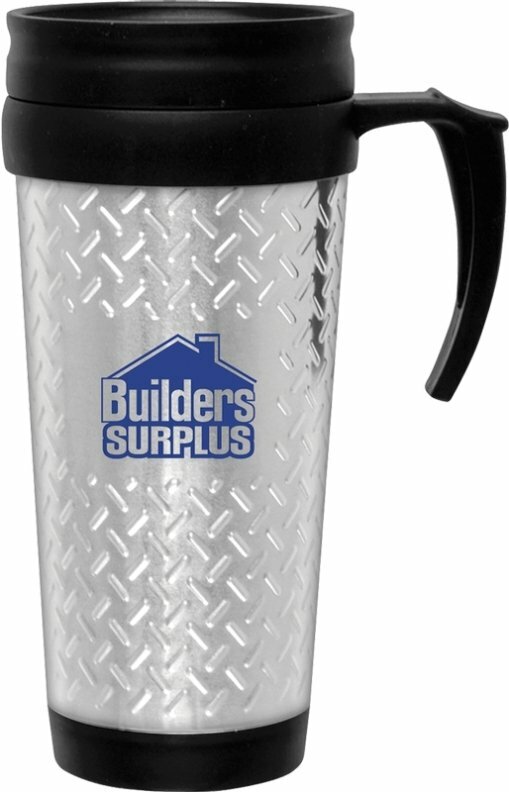 Stainless mug features include stainless steel outer with BPA free black. plastic liner, double wall insulation, large handle, push slide-n-drink lid. Overall size of the mug is 7 1/4 h x 3 1/4 top dia x 2 1/2 bott. dia. Price includes one std. color imprint on the front area 1 3/4" w x 1 1/8" h.
Factory setup charge is $55.00. One Color Imprint Only.